Scott Beaudry, Theresa Chu, and their dog, Barley. Many of the world’s biggest companies will pay millions of dollars to buy a coveted TV commercial spot during next month’s Super Bowl. This year, Illinois State University alum Scott Beaudry’s home-grown dog treat business could be right there with them—and it didn’t cost him a penny. Beaudry’s Barley Labs LLC is one of four finalists in Intuit’s Small Business Big Game contest, sponsored by Intuit QuickBooks. Beaudry and his partner, Theresa Chu, make all-natural dog treats using recycled barley from a local brewery, and if they win the contest Intuit will pay to produce a commercial for Barley Labs and air it during Super Bowl XLVIII on February 2. Needless to say, a Super Bowl ad would be a game-changer for Barley Labs, which Beaudry launched in fall 2012 out of his home in Durham, North Carolina. He had recently upgraded his home beer-brewing equipment but felt guilty just throwing away the 60 pounds of leftover grain after each session. 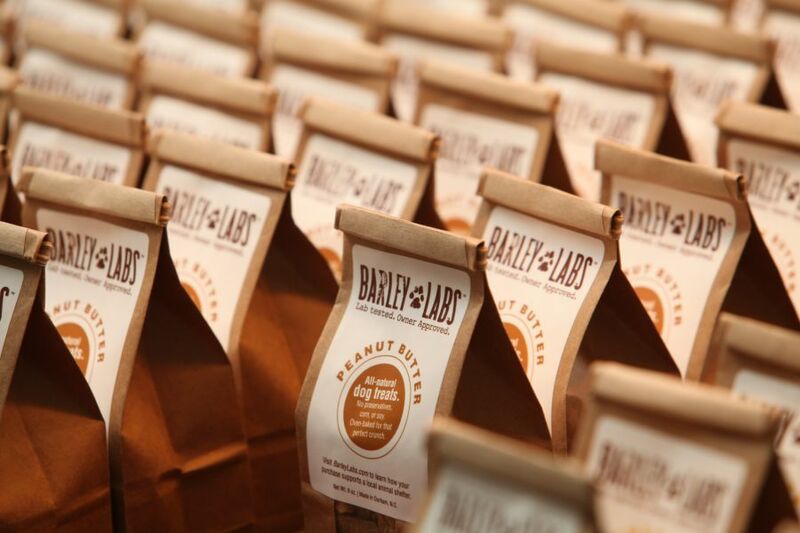 Barley Labs now has nearly 20 retailers in six states, plus online sales. “You can only compost so much,” he said, and the bread and cookies he tried to make using the spent grain were “pretty terrible.” So Beaudry and Chu started using the grain to make treats for their dog Barley, an adorably goofy Lab-mix they adopted from a local animal shelter. Barley loved them, and so did other dogs who tried them, and Barley Labs was born. Last year, Beaudry and Chu entered the Small Business Big Game contest and tried to rally public support for the voting stage. That got them into the Top 20, and Intuit’s staff put them in the Top 4. So how did Barley Labs beat out thousands of other small businesses? The winner hasn’t been announced yet, but just being a finalist has generated a lot buzz and exposure for Barley Labs. They now have nearly 20 retailers in six states (plus online sales), moved from their home to a commercial kitchen in Durham, and gotten some IT and software help from Intuit to scale up. Beaudry still works full time at North Carolina State University, where he puts his data-driven master’s degree to good use as a data analyst. Chu, meanwhile, may shift full time to Barley Labs in the near future. When they made the Top 4, Beaudry and Chu were visited by entrepreneur and reality TV star Bill Rancic, who spoke to Beaudry and shook up his initial vision for how quickly Barley Labs might expand after the contest. What if it’s not slow and steady, but rapid and seemingly overnight? Could they handle it? Watch Barley Labs entry video on SmallBusinessBigGame.com.